The paper presents methods for instantaneous harmonic analysis with application to high-quality pitch, timbre, and time-scale modifications. The analysis technique is based on narrow-band filtering using special analysis filters with frequency-modulated impulse response. The main advantages of the technique are high accuracy of harmonic parameters estimation and adequate harmonic/noise separation that allow implementing audio and speech effects with low level of audible artifacts. Time stretch and pitch shift effects are considered as primary application in the paper. Parametric representation of audio and speech signals has become integral part of modern effect technologies. The choice of an appropriate parametric model significantly defines overall quality of implemented effects. The present paper describes an approach to parametric signal processing based on deterministic/stochastic decomposition. The signal is considered as a sum of periodic (harmonic) and residual (noise) parts. The periodic part can be efficiently described as a sum of sinusoids with slowly varying amplitudes and frequencies, and the residual part is assumed to be irregular noise signal. This representation was introduced in  and since then has been profoundly studied and significantly enhanced. The model provides good parameterization of both voiced and unvoiced frames and allows using different modification techniques for them. It insures effective and simple processing in frequency domain; however, the crucial point there is accuracy of harmonic analysis. The harmonic part of the signal is specified by sets of harmonic parameters (amplitude, frequency, and phase) for every instant of time. A number of methods have been proposed to estimate these parameters. The majority of analysis methods assume local stationarity of amplitude and frequency parameters within the analysis frame [2, 3]. It makes the analysis procedure easier but, on the other hand, degrades parameters estimation and periodic/residual separation accuracy. improved harmonic parameters estimation accuracy. The analysed signal is separated into periodic and residual parts and then processed through modification techniques. Then the processed signal can be easily synthesized in time domain at the output of the system. The deterministic/stochastic representation significantly simplifies the processing stage. As it is shown in the experimental section, the combination of the proposed analysis, processing, and synthesis techniques provides good quality of signal analysis, modification, and reconstruction. where is the length of the frame. The transformation gives spectral representation of the signal by sinusoidal components of multiple frequencies. The balance between frequency and time resolution is defined by the length of the analysis frame . Because of the local stationarity assumption DFT can hardly provide accurate estimate of frequency-modulated components that gives rise to such approaches as harmonic transform  and fan-chirp transform . The general idea of these approaches is using the Fourier transform of the warped-time signal. The Hilbert transform and DESA can be applied only to monocomponent signals as long as for multicomponent signals the notion of a single-valued instantaneous frequency and amplitude becomes meaningless. Therefore, the signal should be split into single components before using these techniques. It is possible to use narrow-band filtering for this purpose . However, in the case of frequency-modulated components, it is not always possible due to their wide frequency. The required instantaneous parameters can be calculated using expressions (18). The frequency-modulated filter has a warped band pass, aligned to the given frequency contour that provides adequate analysis of periodic components with rapid frequency alterations. This approach is an alternative to time warping that is used in speech analysis . In Figure 1 an example of parameters estimation is shown. The frequency contour of the harmonic component can be covered by the filter band pass specified by the centre frequency contour and the bandwidth . Frequency-modulated analysis filter N = 512. Center frequency contour is adjusted within the analysis frame providing narrow-band filtering of frequency-modulated components. Estimation accuracy degrades close to borders of the frame because of signal discontinuity and spectral leakage. However, the estimation error can be reduced using wider passband—Figure 2. In any case the passband should be wide enough in order to provide adequate estimation of harmonic amplitudes. If the passband is too narrow, the evaluated amplitude values become lower than they are in reality. It is possible to determine the filter bandwidth as a threshold value that gives desired level of accuracy. The threshold value depends on length of analysis window and type of window function. 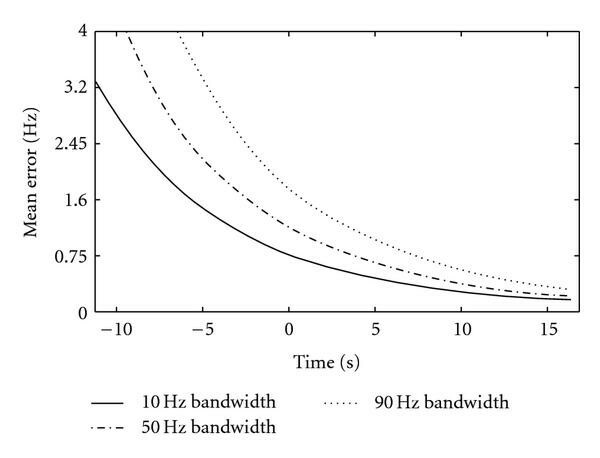 In Figure 3 the dependence for Hamming window is presented, assuming that amplitude attenuation should be less than −20 dB. Minimal bandwidth of analysis filter. It is evident that required bandwidth becomes more narrow when the length of the window increases. It is also clear that a wide passband affects estimation accuracy when the signal contains noise. 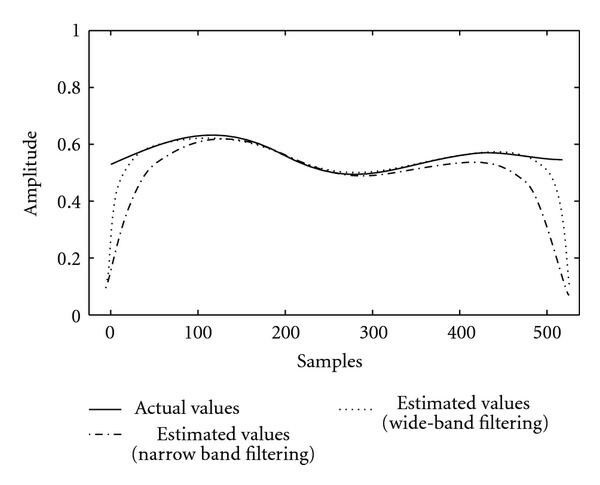 The noise sensitivity of the filters with different bandwidths is demonstrated in Figure 4. In this subsection the general technique of sinusoidal parameters estimation is presented. The technique does not assume harmonic structure of the signal and therefore can be applied both to speech and audio signals . 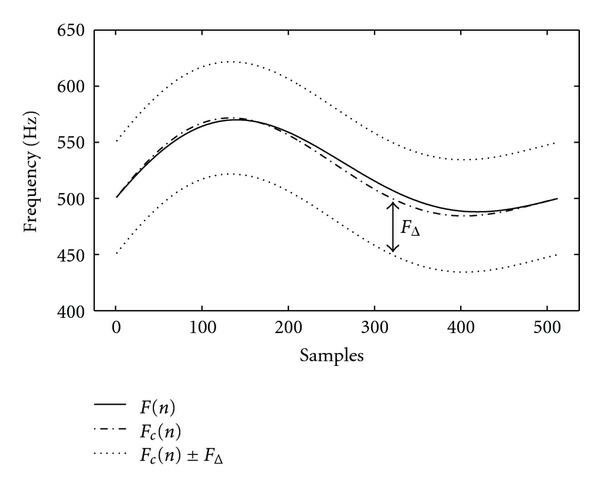 In order to locate sinusoidal components in frequency domain, the estimation procedure uses iterative adjustments of the filter bands with a predefined number of iterations—Figure 5. At every step the centre frequency of each filter is changed in accordance with the calculated frequency value in order to position energy peak at the centre of the band. At the initial stage, the frequency range of the signal is covered by overlapping bands (where is the number of bands) with constant central frequencies , respectively. At every step the respective instantaneous frequencies are estimated by formulas (15) and (18) at the instant that corresponds to the centre of the frame . Then the central bandwidth frequencies are reset , and the next estimation is carried out. When all the energy peaks are located, the final sinusoidal parameters (amplitude, frequency, and phase) can be calculated using the expressions (15) and (18) as well. During the peak location process, some of the filter bands may locate the same component. Duplicated parameters are discarded by comparison of the centre band frequencies . Sinusoidal parameters estimation using analysis filters: (a) initial frequency partition; (b) frequency partition after second iteration. In order to discard short-term components (that apparently are transients or noise and should be taken to the residual), sinusoidal parameters are tracked from frame to frame. The frequency and amplitude values of adjacent frames are compared, providing long-term component matching. The technique has been used in the hybrid audio coder , since it is able to pick out the sinusoidal part and leave the original transients in the residual without any prior transient detection. In Figure 6 a result of the signal separation is presented. The source signal is a jazz tune (Figure 6(a)). Periodic/stochastic separation of an audio signal: (a) source signal; (b) periodic part; (c) stochastic part. The analysis was carried out using the following settings: analysis frame length—48 ms, analysis step—14 ms, filter bandwidths—70 Hz, and windowing function—the Hamming window. The synthesized periodic part is shown in Figure 6(b). As can be seen from the spectrogram, the periodic part contains only long sinusoidal components with high-energy localization. 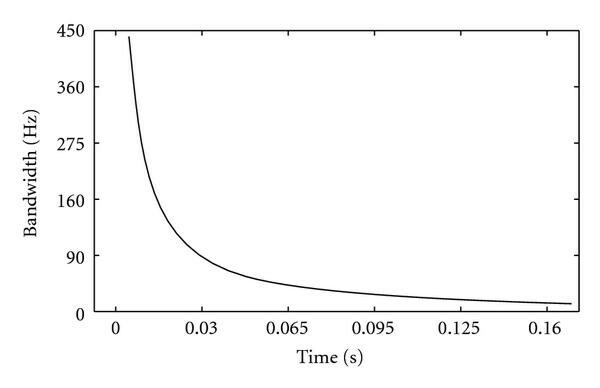 The transients are left untouched in the residual signal that is presented in Figure 6(c). 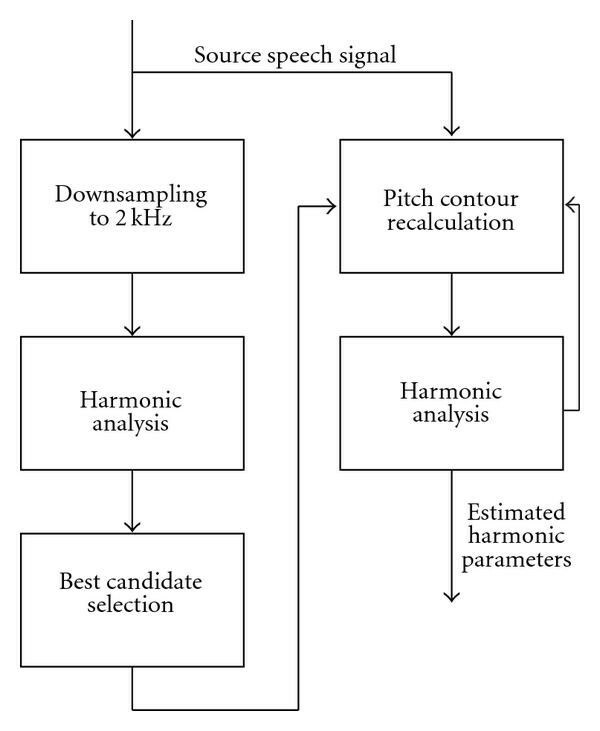 harmonic parameters estimation with fundamental frequency adjustment. 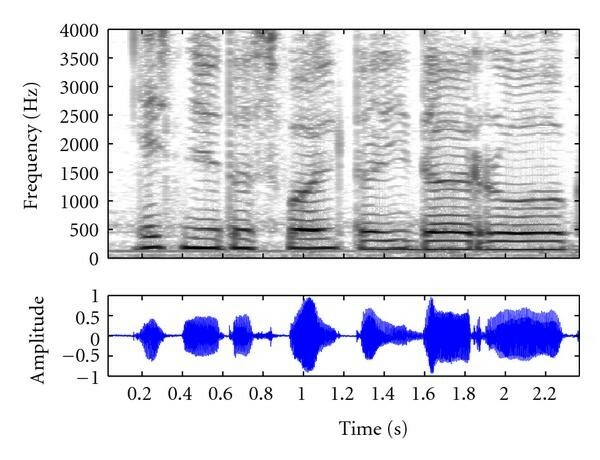 In voiced speech analysis, the problem of initial fundamental frequency estimation comes to finding a periodical component with the lowest possible frequency and sufficiently high energy. Within the possible fundamental frequency range (in this paper, it is defined as Hz) all periodical components are extracted, and then the suitable one is considered as the fundamental. In order to reduce computational complexity, the source signal is filtered by a low-pass filter before the estimation. The fundamental frequency values become more precise while moving up the frequency range. It allows making proper analysis of high-order harmonics with significant frequency modulations. Harmonic parameters are estimated using expressions (10)-(11). After parameters estimation, the periodical part of the signal is synthesized by formula (1) and subtracted from the source in order to get the noise part. where —energy of the estimated harmonic part and —energy of the estimation error (energy of the difference between source and estimated harmonic parts). The signals were analyzed using the proposed technique and STFT-based harmonic transform method . During analysis the same frame length was used (64 ms) and the same window function (Hamming window). In both methods, it was assumed that the fundamental frequency contour is known and that frequency trajectories of the harmonics are integer multiplies of the fundamental frequency. The results, reported in Table 1 show that the measured values decrease with values. However, for nonstationary signals, the proposed technique provides higher values even when is low. Results of synthetic speech analysis. An example of natural speech analysis is presented in Figure 8. The source signal is a phrase uttered by a female speaker ( kHz). Estimated harmonic parameters were used for the synthesis of the signal's periodic part that was subtracted from the source in order to get the residual. 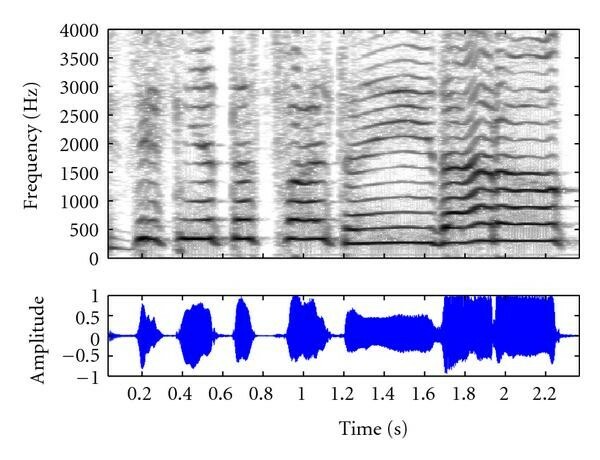 All harmonics of the source are modeled by the harmonic analysis when the residual contains transient and noise components, as can be seen in the respective spectrograms. Since the periodic part of the signal is expressed by harmonic parameters, it is easy to synthesize the periodic part slowing down or stepping up the tempo. Amplitude and frequency contours should be interpolated in the respective moments of time, and then the output signal can be synthesized. The noise part is parameterized by spectral envelopes and then time-scaled as described in . Separate periodic/noise processing provides high-quality time-scale modifications with low level of audible artifacts. In this section an example of vocal processing is shown. The concerned processing system is aimed at pitch shifting in order to assist a singer. The voice of the singer is analyzed by the proposed technique and then synthesized with pitch modifications to assist the singer to be in tune with the accompaniment. The target pitch contour is predefined by analysis of a reference recording. Since only pitch contour is changed, the source voice maintains its identity. The output signal however is damped in regions, where the energy of the reference signal is low in order to provide proper synchronization with accompaniment. The reference signal is shown in Figure 9, it is a recorded male vocal. The recording was made in a studio with a low level of background noise. The fundamental frequency contour was estimated from the reference signal as described in Section 3. As can be seen from Figure 10, the source vocal has different pitch and is not completely noise free. The source signal was analyzed using proposed harmonic analysis, and then the pitch shifting technique was applied as has been described above. The synthesized signal with pitch modifications is shown in Figure 11. As can be seen the output signal contains the pitch contour of the reference signal, but still has timbre, and energy of the source voice. The noise part of the source signal (including background noise) remained intact. The stochastic/deterministic model can be applied to voice processing systems. It provides efficient signal parameterization in the way that is quite convenient for making voice effects such as pitch shifting, timbre and time-scale modifications. The practical application of the proposed harmonic analysis technique has shown encouraging results. 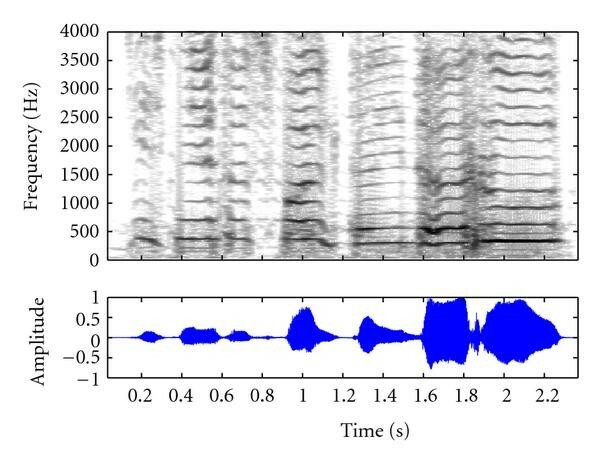 The described approach might be a promising solution to harmonic parameters estimation in speech and audio processing systems . This work was supported by the Polish Ministry of Science and Higher Education (MNiSzW) in years 2009–2011 (Grant no. N N516 388836).